The Connective Corridor Façade Improvement Program was funded through Empire State Development which allocated three rounds of funding totaling $1,075,000 to help improve 70 properties in the Connective Corridor district. All three funding rounds are now closed and applications are no longer being accepted. Many projects are done, with more being completed in 2016. The program is administered by Syracuse University’s Office of Community Engagement and Economic Development. It provides funding assistance to improve the physical and aesthetic conditions of properties along and adjacent to the Connective Corridor, thereby enhancing the urban experience of living, working and enjoying cultural opportunities in University Hill and downtown Syracuse. 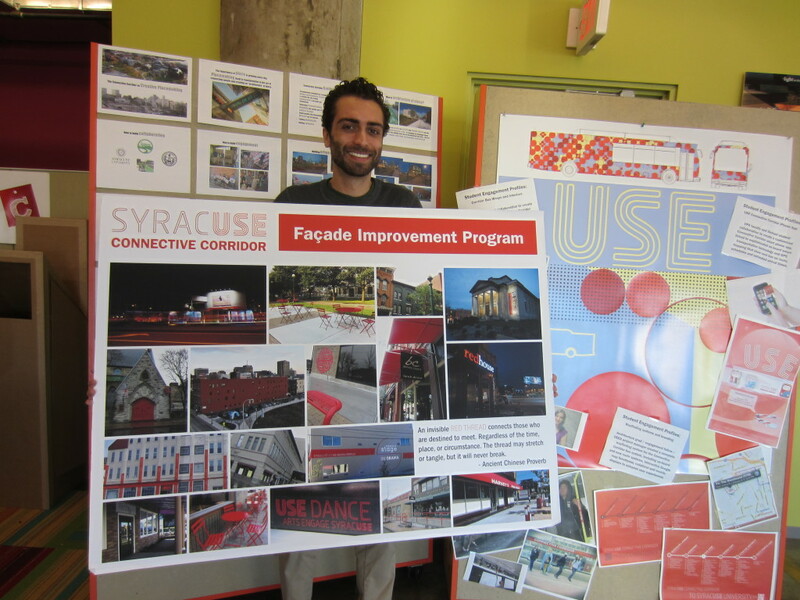 It is managed by a community-based Connective Corridor Façade Committee that includes representatives from Syracuse University, the City of Syracuse and the Downtown Committee of Syracuse, as well as other University Hill faculty and staff with experience in architecture and landscape design, and community members with expertise in historic preservation, real estate, and community development. The program encourages the development of a distinct identity for the Connective Corridor in a way that respects and preserves the unique or historical character of individual properties, while including design elements that mark the route, and create opportunities for business development. The maximum award was $25,000 per property. Fostering a high level of reinvestment in properties and storefronts along the route. Commercial, industrial, mixed use and non-profit properties. For-profit and non-profit organizations were eligible. Property owners and tenants were eligible to apply. Tenants needed a lease agreement in place and statement of permission from the property owner. Integration of the Connective Corridor design aesthetic. Applicants were encouraged to visibly integrate design elements consistent with the Connective Corridor brand elements developed as a “Kit of Parts” by external design consultants which included B&L Engineering, OLIN, Tillett Lighting Design and Pentagram. Improved vacant space or structure. Plans that included new tenant commitments or otherwise improve the façade – particularly on ground floor locations – by addressing vacant window spaces, making repairs, removing outdated signage, and/or incorporating interior lighting. Enhances historic preservation. Plans that restored or improved buildings that have status or are eligible for the National Register, or are listed or eligible for local protected sites or district status. Materials and techniques used must conform to standards for such designated properties. Iconic lighting of architecturally significant buildings. Plans that illuminated historically significant structures along or visible from the Connective Corridor street or bus route. Increased social or economic activity. Plans that facilitated the addition of dining or retail establishments, expansion of cultural activity, and/or the creation of outdoor accommodations such as a café or seating area. Inclusion of artwork in façade improvement plan. Plans that integrated artwork such as murals, graphics, storefront galleries or transmedia projections to further reflect the cultural richness of the community. Green materials. Improvements that included the use of environmentally-friendly materials. Leveraged funds. Applicants that demonstrated that were investing private funds or other non NYS-sources of funds to acquire, and/or complete interior and exterior renovations of the property. Projects with greater equity match, were scored more competitively. An equity match was required.